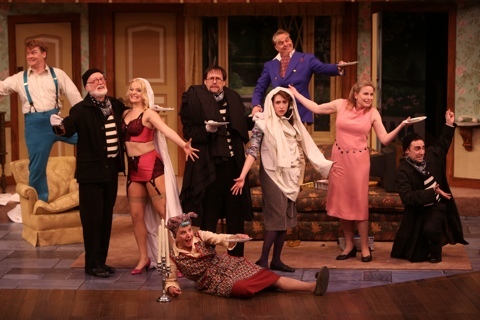 The entire cast of “Noises Off” poses for the finale at the Repertory Theatre of St. Louis. Photo: Jerry Naunheim, Jr.
Rep go-to director, Edward Stern, provides yet another theatrical gem with a cast more than up to the task. With Michael Frayn’s reworking of the script- this latest in 2011- we’re treated to two acts instead of three and the Mainstage turntable makes this possible as the second act performed almost in mime backstage while the play is going on “behind the scenes” to us, and then a return to the real stage in this fictitious play within a play goes smoothly without missing a laugh. A play on his own title, Frayn’s fictitious play, “Nothing On,” lets the bumbling- often disinterested- players go through a dreadful dress rehearsal before our peek backstage as the play opens and finally the atrocious final performance where everything is still going wrong making the play even funnier for the real audience (us) since we’ve been privy to egos, illicit affairs, actors with drinking problems and all of the other things that make an actor’s life less than glamorous offstage. 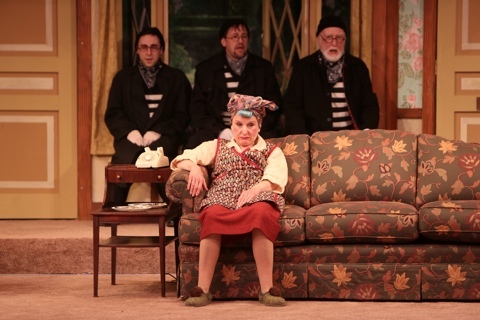 Dale Hodges sits frustrated on the sofa while the trio of Kevin Sebastian, Fletcher McTaggart and Joneal Joplin bring us yet another great sight gag in the Rep’s “Noises Off.” Photo: Jerry Naunheim, Jr.
Dale Hodges opens the show as Dotty, playing Mrs. Clackett onstage. The infamous “sardine” props and fuel for some of the funniest moments in “Nothing On,” come into play immediately and set up one of the great running gags of all time. She is hilarious as the befuddled actress playing an equally befuddled maid. John Scherer returns to the Rep stage as the bumbling Garry with a deft hand for comedy and slapstick. Ruth Pferdehirt is also precise and uproarious as the ditzy blonde (both on and offstage) who spends most of her time scantily clad. The stuffy actor prone to nosebleeds, Frederick, is given a properly pompous performance by Andy Prosky while Victoria Adams-Zizchke is right on the money as the long-suffering Belinda Blair. 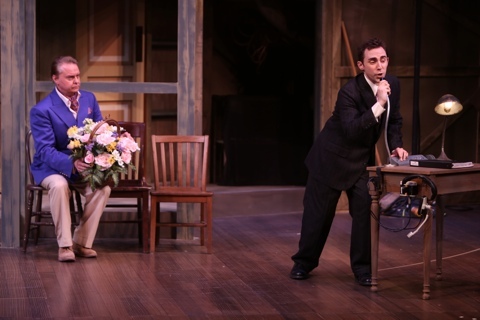 John Scherer and Ruth Pferdehirt as Garry and Brooke in “Noises Off” at the Repertory Theatre of St. Louis. Photo: Jerry Naunheim, Jr.
With various states of despair and outrage, Fletcher McTaggart is wonderful as director Lloyd Dallas. Rebecca Miller shines as the victim of unrequited love, Poppy who gets into a wonderful piece of business with stage manager Tim Allgood on announcing the “start of the show” to the audience from backstage. As Tim, Kevin Sebastian is a model of a person trying to mold a working unit out of the chaos that is going on both onstage and off. Looking back at the Rep’s production of this show in 1989, the now famous St. Louis native, Norbert Leo Butz played this role. Also from that production, playing the inebreated “veteran” actor, Selsdon Mowbray, was a Rep legend, the late Brendan Burke. And I’m sure he played the role in his trademark slippers that he seemed to wear in every production he did. In this production, a living legend of St. Louis theatre in general and the Rep in particular is Joneal Joplin. He is simply remarkable as the beffudled actor playing a cat burglar who can’t seem to get his entrances or his lines quite right. Andy Prosky as Frederick and Kevin Sebastian as Tim during a calmer moment in the second act opening of “Noises Off” at the Rep. Photo: Jerry Naunheim, Jr.
With a superb acting ensemble, the show really relies of the split second timing with both those infamous slamming doors and the beautifully choreographed shenanigans going on backstage during that zany opening to the second act. Edward Stern is a master at his craft and give us all (and maybe a little bit more) that we expected. James Wolk’s delightful set design enhances the French farce feeling of the play and Peter E. Sargent’s lights are right on the money. And congratulations are in order for the old pro, Mr. Sargent, for his recent honor as recipient of the Missouri Arts Awards for Leadership In The Arts. Elizabeth Covey’s costumes are a treat as well and be sure to read your program thoroughly because, besides the full playbill for the fictitious “Nothing On,” there are bios for all of the fictitious actors in the play within a play as well as an hilarious “program note” on bedroom farce. This is non-stop hilarity at it’s best. “Noises Off” has been one of the most popular shows in repertory, community and college theaters for years but, as the old axion goes, “it’s all in the timing.” And this closing production at the Rep has the timing, the actors and director who combine to make it all work beautifully. 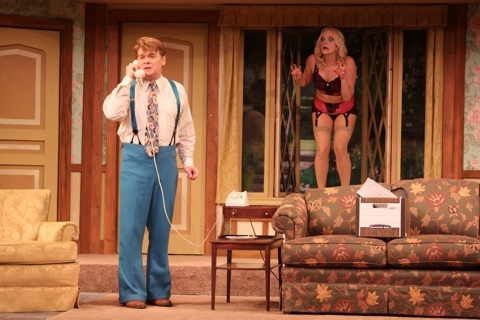 “Noises Off” plays on the Repertory Theatre of St. Louis Mainstage through April 13th. Do yourself a favor and give them a call at 314-968-4925 and get those tickets now. This entry was posted on March 25, 2014 at 9:43 am03 and is filed under Uncategorized. You can follow any responses to this entry through the RSS 2.0 feed. You can leave a response, or trackback from your own site.